We have a stunning range of window blinds to fit any home or window type in Stirling. Covering central Scotland, our sales reps are available for properties in the Stirling and surrounding areas. Book an appointment to have one of our reps come to you, providing you with a no-obligation quote. Here are just some of the window blinds we can offer you in the Stirling area. Rollers are the perfect choice for many rooms in the home such as the bedroom, living room, bathroom and kitchen. Our beautiful made to measure roller blinds come in a wide variety of fabric designs. From very modern and contemporary funky patterned fabrics, to textured and classic plain fabric colours. Each one carefully chosen for quality, design, ease of use and longevity. For the bedroom we have a very wide collection of patterned blackout fabrics, as well as the most beautiful and luxurious plain blackout colours available. From subtle fabrics to very bright and bold fabrics that are ideal for a children’s bedroom or baby’s nursery. All these materials are extremely thermally efficient and perfect for blocking out the early morning sunlight that can sometimes be a problem, to ensure a good night’s sleep. Whatever room and window you wish to adorn with a stunning roller, we are sure you will find a design amongst our collection to suit to the décor of your home. Whether you need a roller for french doors, a bay window or perhaps your conservatory, our wide collection of high quality made to measure roller shades means there is a design to compliment and match any colour scheme, and really enhance the look and feel of any window. All the materials and fabrics we use are of the finest quality, and the components used to manufacture our roller shades are carefully sourced to ensure they will look fabulous and give you years of trouble free operation. With such a stunning range of contemporary and designer fabrics to choose from we are confident that there is a blind to compliment and add a real sense of fashion to any window. The dramatic and very funky patterned fabrics are the ideal way to create a real focal point in any room of your home, allowing you to really express and reveal a unique and creative style that will be a real talking point. We have an extensive range of luxury, made to measure, wooden blinds to offer you a diverse range of style for the inside your home or conservatory. Our collections range from a light wood to the high drama of the gloss collection. The soft grain collection with its rich natural finish contrasts with the sheer flawlessness of the perfect grain, while the beautifully formed white wooden blinds and black wooden blinds collection completes this extensive choice of exceptional quality wood venetians. Wood is a natural insulator, helping to keep the cold out during the winter months while the white stained woods will reflect the sun and help keep your interior space or conservatory cool during the summer. We have a wide range of ladder tape or trim colours and options to choose from, enabling you to design a wood blind that is truly unique and stylish and will add a very natural and luxurious look to any window of your home. 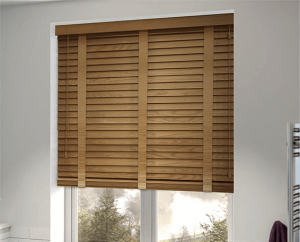 With only the best components and woods used in our made to measure wooden blinds you can be assured that your wood venetian blind will not only look fabulous, but will give you years of hassle free service. 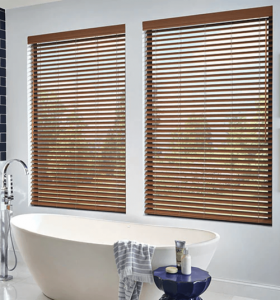 Whether you require a wooden blind for your kitchen window, bathroom window or bedroom, with our wide range of horizontal wood slat colours and stains to choose from you are sure to find the venetian blind that is right for your home. 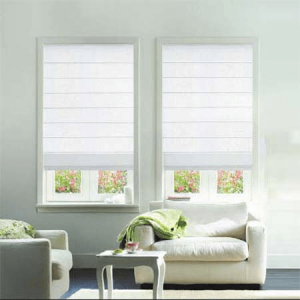 Each one carefully selected for not only its beauty and natural good looks but to ensure you will have a blind that will give you many years of trouble free operation and sunlight control. Whatever room of your home you decide to add wooden blinds you are guaranteed to be thrilled with the real look of luxury, style and taste they bring to any window. Whether you go for a dark wood blind to compliment your dark flooring or maybe a picture frame, or a light wood blind to coordinate with your coffee table or other wooden furnishing, they will really help to bring the look together in a very natural and seamless manor. We can offer a wide range of stylish plain vertical fabrics featuring colours that range from very natural to very bright fabrics. Our colourful collection of blackout and plain fabric slats makes it very easy to find a blind that is perfect for the colour scheme in any room of your home, office or conservatory. We can offer you various blackout or patterned fabrics from modern to more contemporary timeless designs, ensuring whatever blinds you buy they will fit your home. Our customers have used our vertical window blinds for a range of projects from total house projects to creating that perfect environment for the newest addition to your family. 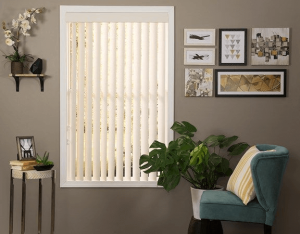 If you are looking for vertical blinds offering you the flexibility to control the amount of sunlight and privacy you require in a room then you have come to the right place. Perhaps your existing vertical blind slats have become a bit drab or frayed over time or through the attention of a much loved pet! If you contact us we can work with you to provide replacement vertical blinds saving you both time and money. We can also provide you with a wide range of accessories including replacement chains and other parts. 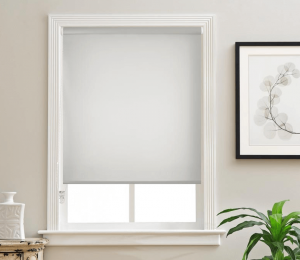 Whether you are going for a complete new look or just to update an existing one Cross Blinds will work with you to ensure delivery of the perfect vertical blind direct to your home. Here we have the most practical member of the blinds family. They come with a wide range of inherent benefits as standard. Venetians are both stylish and functional making them ideal for any room of the home including the kitchen and bathroom. You will find them in a variety of colours through the spectrum from white to black or a stunning finish of metallic or chrome. We also have a beautiful range of wood (faux-wood) effect or real wood blinds. 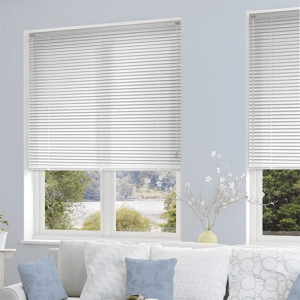 Venetian Blinds are custom made to measure blinds that will fit your measurements precisely and offer you the complete control of how much light gets into the room, tilting the slats to direct the light to exactly where you need it, away from the TV or towards a sun loving pet. The clean simple lines of venetians have for a long time been the favourite with interior designers who demand both style and functionality. They have been installed in homes, conservatories, hospitals and offices, having a wide selection of styles and finishes to really enhance all applications. With extra wide sizes and extra long drops available for large windows. 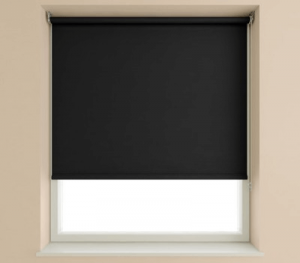 We have a wonderful selection of high quality made to measure blackout roller blinds with many colours available, that are custom made to your sizes using only the finest components and fabrics available. They are the ideal choice if you are looking to control the amount of sunlight and privacy you require in a bedroom or any room of the home, whilst adding real style and luxury to your windows. They are built to last and constructed on a heavy duty aluminium roller tube and feature a very high quality chain control mechanism to roll the blind up and down. With such a wide variety of blackout blind fabrics to select from there is a colour to beautifully match or co-ordinate with any room’s colour scheme or interior decor. Blocking out the sunlight in a fun and colourful way has never been easier and cheaper. They offer a substantial reduction in the amount of light entering through a window, enabling a good night’s sleep, or if you have settled down to watch a film during the day and want to keep the sunlight off the TV. As well as cutting out the light, our beautiful blackout blinds are extremely thermally efficient. The lining on the back of the thermal blackout blinds fabric has a dramatic effect on the amount of heat it prevents from escaping through the glass of the window. Conversely it will keep the heat out during the summer months, helping to keep the room nice and cool. You know you want blinds, but are still unsure what will look best in your bay window or against those beautiful french doors, well luckily for you we have a stunning range of designer roman fabrics that will compliment the most traditional of homes, to the very modern and luxurious contemporary design master pieces. We can offer you made to measure roman blinds from a wide range of fabric companies. such as prestigious textiles and room fabrics that will bring your windows to life and create a real focal point in any room of the home. Have you ever wondered how to make roman blinds? Well we are here to take your worries away with our high quality sumptuous blinds. Our roman blinds of a very high quality and as they are custom made to measure blinds, you are guaranteed to achieve the exact look you are aiming for. You have stumbled upon the best place to buy roman blinds that are of the finest quality and brought to you direct. Perhaps the room you are looking to add your own unique and personal tastes to needs the additional benefit of blackout features, such as a bedroom or living room that gets a lot of sunlight. This is easily achieved and will only enhance the functionality of our already very practical and fabulously funky fabrics. We have a huge choice of fabrics for you, from floral patterns to timeless plain fabrics, ranging from the brightest of pinks to the most stylish of subtle and natural textures. Whichever room you are looking to adorn with one of our roman blinds, whether it is the kitchen, bathroom or bedroom they will add a very sumptuous look and feel to any window whilst creating a stunning and dramatic backdrop to any room. Allowing you to fully express you individuality and achieve the exact look you are trying to achieve with your interior design ideas or vision. Our wide range of contemporary designer fabrics will bring to life any home. With a choice of very bold and beautiful floral patterned fabrics that are very striking and add a real modern twist incorporating beautiful leaves, flowers and blooms. Extremely funky and colourful prints that bring real warmth, luxury and style to any window. And not forgetting the more classic and traditional plain fabrics that offer a very sophisticated and tranquil look. With such a wide range of high quality designer soft fabrics to choose from in such wonderful colours it is easy to find a shade that will compliment your homes decor in the most fabulous way. With colours available to buy online such as cool white, dramatic black and much more colourful and contemporary lime green, bright pink, orange, red and blue there is a fabric to suit any colour scheme. Whether blackout or standard lined our stunning romans are guaranteed to add a very luxurious look to any room. The hardest thing for you to do now is to select your beautiful roman fabric. We also cover the surrounding areas of Stirling, Bannockburn, Bridge of Allen, Doune, Alloa, Dunblane, Larbert, Gargunnok, Tillicoultry and Dollar.